A 12-member team from the Southern Association of Colleges and Schools is visiting Sam Houston State University this week to evaluate whether or not the institution’s accreditation should be reaffirmed for the next 10 years. The visit is one of the final steps in the process of reaffirmation after a nearly three-year self-study by a group representing SHSU faculty, staff and administrators. Dean of Graduate Studies and Associate Vice President for Academic Affairs Mitchell Muehsam has represented the university as the SACS liaison during the process and managed and organized the campus-wide effort to demonstrate SHSU’s compliance with standards set forth by the association. Launched in 2006, SHSU’s self-study, which examined every aspect of the university’s operation, has involved more than 100 individuals from across campus. While they are at SHSU, the peer-review team will examine data and conduct a wide variety of interviews that will help identify education strengths and weaknesses. “They will verify and review our compliance with the association’s standards, and they will review and offer suggestions for our Quality Enhancement Plan, known as a ‘QEP’,” said Muehsam. The QEP is an initiative that enhances some area of student learning and is required for the SACS reaffirmation process. 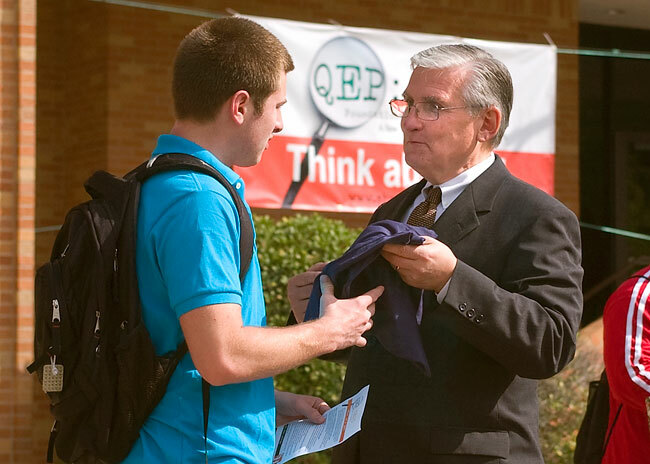 Sam Houston State’s QEP is an undergraduate course entitled “Foundations of Science: Improving Scientific Reasoning Among Non-Science Majors” and is designed to strengthen the scientific reasoning and critical thinking skills of SHSU students. The course (BIO/GEL/GEO 146) will be offered for the first time in the fall. Not only does reaffirmation confirm that a university is on the “right track” with its educational goals, it means that an institution remains eligible for federal funds for student loans and grants under Title IV programs. The visit will conclude March 26 with an exit conference with SHSU President Jim Gaertner and campus administrators. The Commission on Colleges of the Southern Association of Colleges and Schools will announce the reaffirmation decision at the annual meeting in December 2009.